Digitizing World is your destination for conversion between video and all formats of digital media, for editing, uploading, and streaming. We work with anything from professional, high definition formats to older standard definition tape to consumer grade home movies and VHS tapes. We work in both PAL and NTSC. We also convert vinyl records, cassettes, and other types of audio tape to digital audio formats. We scan 35mm negatives and slides, along with medium and large format film. 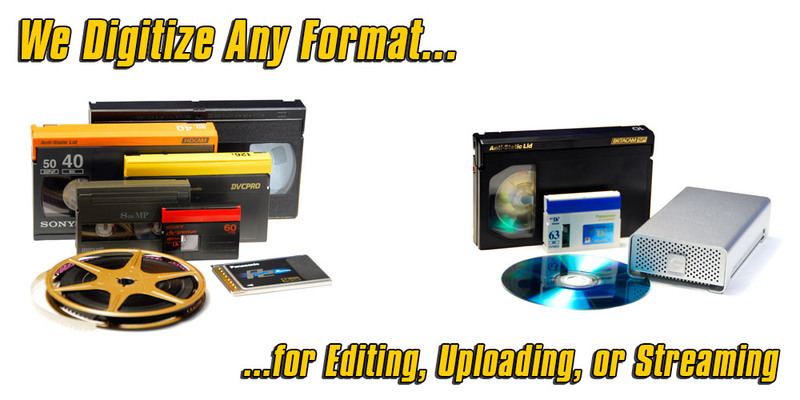 Basically, we can digitize any kind of media you have. At Digitizing World, all work is done on our premises or at your location. We've owned and occupied the same building since 1975. We've been in the professional film and video production business for decades. Standard turnaround time is one week. Same Day and Next Day service is available. Need a custom DVD menu or editing? Need royalty free music? Need duplication? Our professional team is ready to help you with any project, large or small. We know how many different formats are out there! We've seen all of the confusing charts used for pricing and options. Because of this, we spent some time creating our Digitizing Estimate Wizard. We wanted to make it easy for our customers to select the conversion they want and get prices and options immediately. We haven't seen it done this way on any other site, so we believe ours is the first! We will continue to add formats and options to the Wizard as we get feeback from you, our customer.